Li Tieh-Kuai or “Iron Crutch Li” was born during the Han Dynasty (2nd century CE). He lived in the mountains for forty years, where he so devoted himself to practicing meditation that he often forgot to eat or sleep. 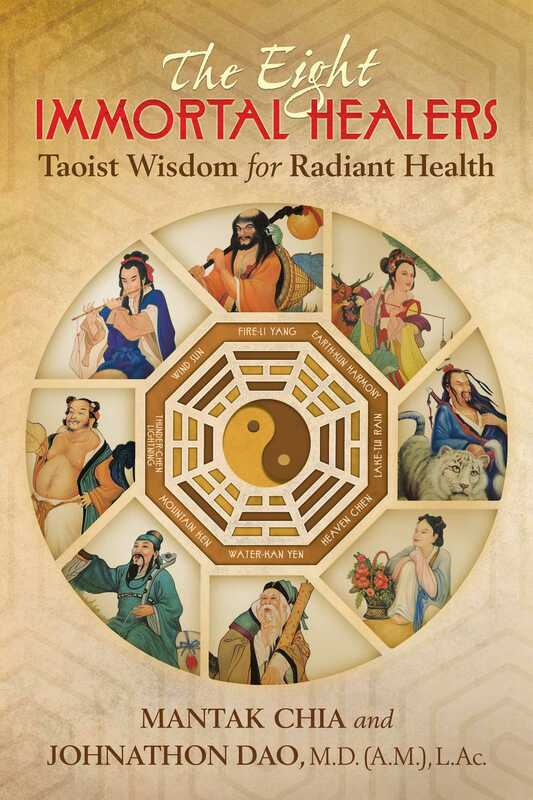 Some legends say that the great Taoist sage Lao Tzu personally introduced him to the Taoist practices. Li Tieh-Kuai is associated with the element of fire. He is considered to be a master of Taoist Inner Alchemy who mastered the five phases of energy and successfully combined yin and yang back into original energy. Inner Alchemy harnesses the energy of fire to clear and purify the energy pathways in the body. In this chapter we will focus on the healing power of internal energy practices that facilitate the free flow of energy throughout the body. Ancient Egyptians referred to internal exercises rather than external exercises in the words of the proverb “Exercise is the daughter of health.” Many of us do not even realize that there is actually a difference between these two exercise forms. Exercises such as swimming, running, cycling, aerobics, and working out at the gym are all external exercises. External exercises work on the external body, such as the muscles and joints. While they do affect the internal organs by increasing circulation, they do not work on balancing the subtle energetic, magnetic, or bioelectric fields within the human body. Internal exercises that are taught in traditional health systems--such as yoga, tai chi, and chi kung--primarily focus on balancing the energy fields of the body and improving the health of the internal organs and energy pathways (meridians) of the body, mind, and spirit. Internal exercises must be combined with external exercises if one is to achieve true health. In the news today we constantly hear stories of professional athletes falling ill and even dying of serious illnesses such as stroke and pneumonia at very young ages. These top athletes may have had external fitness but no internal health. Going to the gym and having physical fitness does not give you true health. True health originates internally and radiates outward. The ancient systems of yoga and chi kung are tried and proven health systems that explore and emphasize both internal and external fitness. But just knowing these ancient health practices will not give you internal health and fitness either. The key to true health is regular daily practice, doing just a few simple exercises that combine both internal and external benefits. One such exercise from the ancient system of yoga in India is the sun salutation. The Surya Namaskar (Sun salutation) is a complete Sadhana (spiritual discipline) in itself for it includes asana, pranayama, mantra, and meditation techniques. The sun salutation exercise is called surya namaskar in Sanskrit, which means “salute to the sun.” It is said that the sun never becomes bored by rising and setting day after day. It does not offer excuses as to why it is impossible for it to perform its important duty. Similarly, we need to faithfully perform our physical and spiritual practices on a daily basis. The sun salutation involves twelve flowing movements and spinal positions, each with a different effect on the organs, glands, muscles, and joints. When performed in the sequence detailed below it can invigorate and strengthen the entire body. Perform several repetitions of this exercise in the early morning six mornings per week, resting one day each week. To begin, stand tall with the feet together, hands by the sides. Position 1. Inhale and exhale bringing the palms together at the chest in “prayer position”; center the body and bring your focus to your heart center. Position 2. Inhale and stretch up and back over the head; focus on lengthening the spine more than on bending so far back. Position 3. Exhale, and bending forward from the hips, put the hands on the floor next to the feet as flat as possible or as close as you can. Make sure that fingers are in line with toes and relax the neck, then slowly straighten the legs as much as you can. Position 4. Inhale and stretch the right foot back as far as possible. Put the right knee on the floor, top of foot flat on floor; stretch the head, arching and lengthening the spine. Position 5. Retaining the inhalation from the last move, hold the breath and bring the left leg back. With both legs back, form a straight, flat plank--push-up position. Position 6. Exhale and slowly drop the knees straight to the floor, then drop the chest between the hands, and then put your forehead down to touch the floor. The buttocks will be slightly raised off the ground when done correctly. Position 7. Inhale, lengthening and straightening the spine while simultaneously arching up and back; legs and hips remain touching the ground. Position 8. Exhale and begin raising the hips, dropping the head between the arms; stretch the back of the legs by pressing the heels closer to the floor. Position 9. Inhale and bring the right foot forward, in line with and between the hands. Touch the left knee to the floor; lengthen the spine and stretch the head up. Position 10. Exhale and bring the left leg forward next to the right, keep the hips as high as possible. Position 11. Inhale and stretch up and bring the arms over the head; arch back but avoid pushing the hips too far forward. Stretch the spine lengthwise as well as backward.